Venezuela was not afraid by the threat of US President Donald Trump that military invasion was the choice to overcome the crisis in the oil-rich country. Venezuelan Vice President Delcy Rodriguez wrote that his people were ready to get rid of foreign military attacks whenever that happened. Based on the information from Rodriguez, Trump’s words were not acceptable. 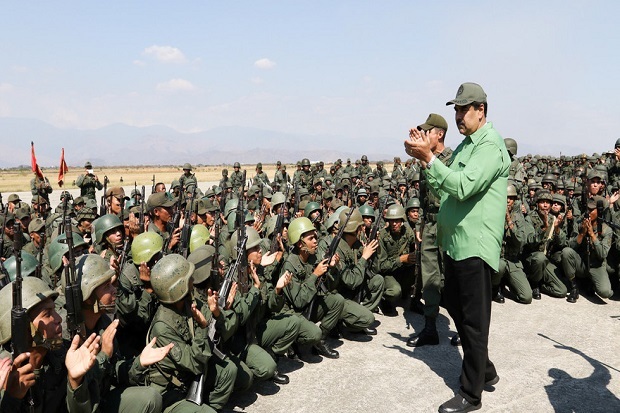 If attacks are carried out against the sovereignty of the state, the army and the people are fully prepared to retaliate. “Sovereignty is not discussed, it is maintained,” said Rodriguez. He added that Venezuelans would be prepared to guard the country’s borders and would not allow foreign interference, regardless of where they came from. “We are not infrequently ready to fend off attacks,” he said, quoted by Russia Today, Monday (4/2/2019). Rodriguez did not specify whether Caracas had taken additional steps to prepare its country for potential foreign military attacks. Before Trump created a threat, speculation that Washington would introduce a military invasion of Caracas came after notepad held by US National Security Adviser John Bolton read “5,000 troops to Colombia”. As is known, Colombia is a Washington ally who participated in overcoming the fall of the regime of President Nicolas Maduro Moros. However, Colombia denied knowing about the signal of deploying 5,000 US troops to its territory. Bogota stressed that Washington did not ask permission to send its troops. Venezuelan Foreign Minister Jorge Arreaza echoed Rodriguez’s statement. According to him, the threat of a military invasion by Trump has indicated that the American president was at the forefront of the coup. Trump’s threat was told to CBS on Saturday last week. He ruled out negotiations with President Maduro. “Sending the US military to Venezuela is a choice,” Trump said. The political crisis in Venezuela worsened after the Chair of the National Assembly or the opposition-controlled Parliament, Juan Guaido, declared himself president while until the latest elections were held. The US and its allies participated in recognizing Guaido as president while Venezuela and did not recognize Maduro as a legitimate leader. The country which was once headed by Hugo Chavez has held the 2018 election. The winner is Maduro from the United Socialist Party of Venezuela (PSUV). However, the opposition leader from the Popular Will (PV) Party, Juan Guaido, did not recognize the victory with a rigged election argument. Instead, Guaido called for a large-scale demonstration to overthrow Maduro. Russia, China, Mexico, Turkey, and many different countries stand behind Maduro and urge a peaceful dialogue to resolve the crisis. While France, Germany, and Spain from the European Union bloc since a week later it has frightened it will follow the US stage to recognize Guaido as a temporary president if the Maduro regime does not hold the latest elections in eight days. The ultimatum was completed on Monday (4/2/2019). The Caracas government has accused Washington of meddling in its domestic affairs by gaining profits from its largest registered oil reserves in the world. Previous Analisis: Para Calon Petinggi Texas Mencari Tahu Apakah Mereka Benar-benar Akan Menang!